The Waterloo Police Department operates 24 hours a day, 7 days a week. The police department administrative offices are open from Monday thru Friday, 8:30 a.m. to 5:00 p.m. and are closed on weekends. During administrative hours, there will be records personnel officer at the front office that you can speak directly with. You may also reach the police department front office by phone during those administrative hours. The phone number is (315)539-2022. You can request a check of your house/property while you are away (vacation, etc.) by calling the Waterloo Police Department or stopping in (Monday-Friday 8:00 a.m. to 4:30 p.m.). You can also fill out the Property Check Form. Copies of police reports are generally available 5 days after the FOIL request is made at the police department. A member of the Waterloo Police Department will contact you when the copy of the report is ready to pick up. How do I report a compliment or complaint about the Waterloo Police Department? If you would like to compliment or complain about any member of the Waterloo Police Department, please fill out the Citizens Comments Form. Where do I pay for a traffic or parking ticket? 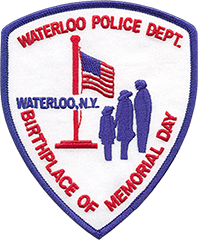 All traffic and parking tickets are paid at the Waterloo Village Court 41 West Main Street Waterloo, NY 13165. How do I take care of a warrant issued for my arrest? You have two choices. You may call 9-1-1 and advise the operator that a warrant has been issued for your arrest and you would like to turn yourself in or you may appear at the Waterloo Police Department and advise the records personnel at the front counter. Pistol permit applications are available from the Seneca County Sheriff’s Office at the Records Division at the Seneca County Law Enforcement Center. The forms are also online for you to fill out and print out to take to the Records Division.